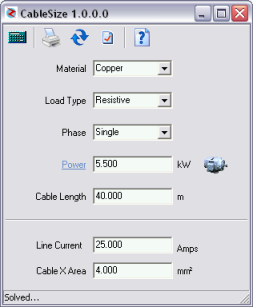 This program does electrical cable sizing, based on the most basic electrical laws. If you are planning to do cable sizing for a real installation, check the results and make sure that you comply with all electrical regulations. The electrical resistance can be derived from the properties of the conductor material. Watch the units in the above equation. The resistance can also be expressed in terms of the material conductivity (ψ) which is just the reciprocal of the resistivity. Combining Ohms law with the resistance expression, we get. Now, we can define an acceptable voltage drop in a conductor. I have calculated the voltage drop that was used in several published tables and get around 5.5 Volts. We could therefore re-arrange this equation to give the cable size. But cables come in standard sizes measured in mm2. In addition, you also need to consider the maximum current for each cable size. So, the theory is relatively simple, let us now see how to use the program. 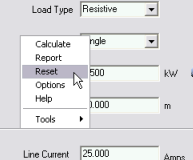 Enter the following and the program calculates line current and cable area. Conductor material. Select from list. Load Type. Resistive for electrical heating or inductive for motors. Power. Use the motor button for a quick lookup. The normal voltage drop is based on 5.5 Volts. You can edit this value if necessary by pressing the [Settings] button. Right-Click anywhere on the form to activate the context menu. This will allow you to activate any of the program functions and run other TechniSolve program tools that you may have installed.